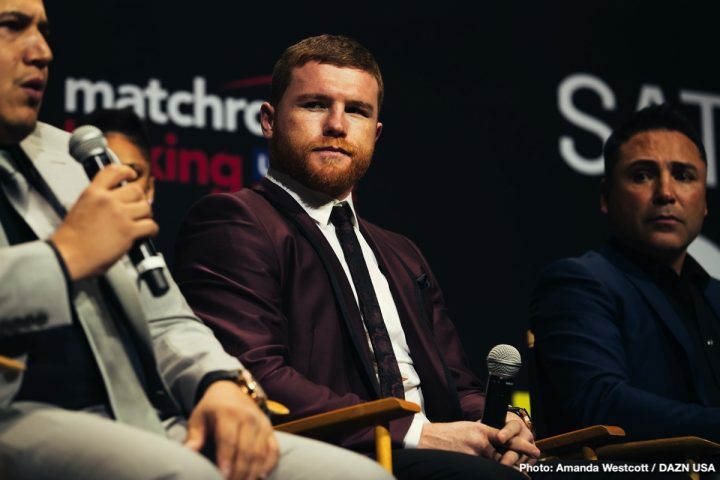 By Aragon Garcia: Saul Canelo Alvarez didn’t mince words in telling the media in a conference call for his upcoming May 4 fight with Daniel Jacobs that Gennady Golovkin will need a world title in order for him to get a trilogy fight in September. Unfortunately, Golovkin doesn’t plan on fighting WBO middleweight champion Demetrius Andrade next to try and capture his title. The word is Golovkin (38-1-1, 34 KOs) plans on fighting either Hassan N’Dam or Steve Rolls in his next fight on June 8 at Madison Square Garden in New York. In other words, Triple G plans on taking a soft fight for his next on June 8, and he won’t be fighting for a world title. There it is. Canelo will grant Golovkin the third fight that he’s asking for under one condition. He MUST capture the WBO middleweight title in order for them to fight. If not, Canelo says he could move up to super middleweight or light heavyweight. It wouldn’t be a good idea for Golovkin to take a safety first approach to picking his next opponent. Canelo has a goal in mind of unifying the middleweight division by winning all four of the 160-pound titles to become the first unified fighter in the history of Mexican boxing. The WBO 160 pound title is held by unbeaten Demetrius Andrade (27-0, 17 KOs). “Everything is possible, everything that is a challenge for me is possible, going to 175 is a possibility, but today we think a hundred percent in this fight, and then we see the rest, the door is open,” Canelo said. Golovkin must pay attention to what Canelo is telling him with this above message. Although, Canelo would like to give GGG what he’s asking for by giving him the third fight, he’s not going to do it unless he wins a world title first against Andrade. It makes perfect sense what Canelo asking for. If Golovkin takes a soft opponent like N’Dam or Rolls in his next fight on June 8, it’s going to hurt the interest in the trilogy fight. The reason being, the boxing fans will see GGG as desperate for a cash out fight to take the fight with Canelo just for money. Canelo wants the fight to have meaning, and it won’t if Golovkin takes an easy fight on June 8. “He has a unique style, he’s a fighter who has all the qualities, he hits, he moves, he’s tall, he’s a fighter with a unique style, but I’ve fought with all styles, if he gathers everything in a single fighter I can with that and more, “said Alvarez. “Everyone wants to come and win, that’s normal, I prepare a lot stronger because I want to make history, everything can happen in boxing, but I always prepare to win, I never think about defeat,” said Canelo.